Please click on a thumbnail for the Aircraft Data Sheet. 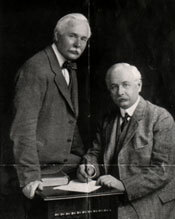 At the turn of the century (1900), the only significant industrial activity in the Yeovil area was that undertaken by Petter Oil Engines Ltd, a family firm founded by Twin brothers Percy and Ernest. By the outbreak of the first World War the company was a major producer of standing oil engines, providing power for small industrial facilities and agricultural applications. By 1915 the business had grown into a major industry with its own foundry and steel working facilities. It was at this point that Sir Ernest Petter offered to devote his entire capability to the war effort, and was promptly awarded a contract from the Admiralty to produce Short Type 184 seaplanes. At the time it had been planned to build a new forge on ground situated to the west of Yeovil, this plan was abandoned and immediately turned over to aircraft manufacture. Designed by Short Brothers as a torpedo carrying seaplane... "Short 166"
A total of 125 of these well-established fighter and bomber aircraft were built... "De-Havilland DH-4"
Westland produced these two seat day bombers during 1916-1917. Production of the DH-9 followed the DH-4 contract, approximately 250 machines were produced. "De-Havilland DH-9A"
A total of 25 of these large and famous twin engined bombers were built at Yeovil. "Westland N.1B"
Offered against a War Office requirement for a single seat fighter in April 1918... "Weasel"
Designed as a light passenger transport... "Limousine III"
The Walrus was a three seat carrier-based spotter-reconnaissance aircraft... "Dreadnought"
The little Woodpidgeon was built as a response to the Air Ministry's Light Aeroplane Competition of 1924. "Widgeon I & II"
Air Ministry Specification 26/23 called for a two-seat long range day bomber for the Royal Air Force. "Wizard I & II"
Built as a private venture, the Wizard was intended as a fast monoplane fighter.